Whether you’re hauling a car down from highway speeds to avoid a deer or panic-stopping a 3/4 ton pickup loaded with kids and ATVs, you want brakes that can dissipate that heat quickly without warping or cracking. 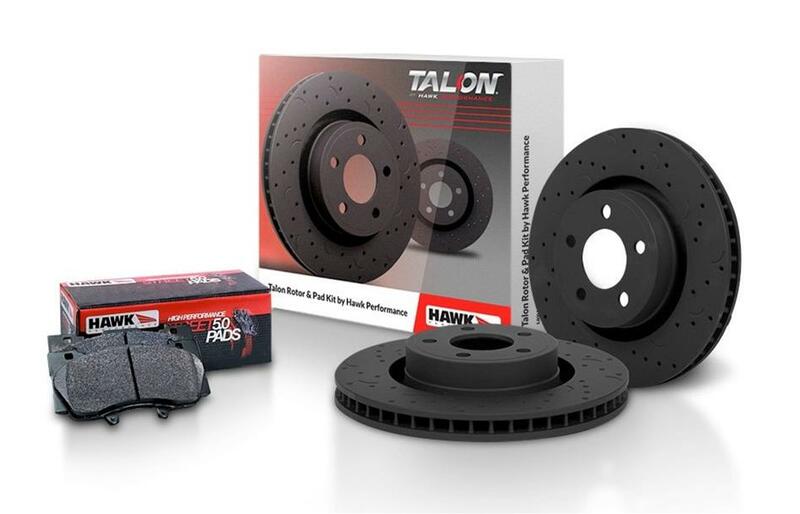 Hawk Performance Talon Rotor and Pad Combos feature custom-designed rotors paired with the right pad for your vehicle to provide maximum stopping power. The Talon rotors are made from G3000 gray cast iron, which contains more carbon than the iron used in ordinary OEM replacement rotors. That makes the Talon rotors stronger and quieter. Hawk also uses a better grade of barrier coating than the common electroplating used by other rotor manufacturers. Its Magni™ coating resists galling for easier brake pad bed-in, and also provides superior corrosion resistance. In fact, Hawk’s process applies the Magni coating on and around the interior veins and the more porous center of the rotor’s core where rust develops fastest. That helps prevent premature failure. All Talon rotors have curved slots—borrowed from Hawk’s DTC racing rotors—to remove brake dust and keep the pad surfaces clean. Hawk even goes through the trouble of engineering the right number of slots and their positions on the rotor based on vehicle’s weight and center of gravity. The design maximizes stopping power—especially under panic braking—and prolongs the life of the rotors and pads. The Talon rotors are available slotted or cross-drilled and slotted. The cross-drilled rotors optimize thermal efficiency, heat dissipation, strength, and improve wet braking, making them the choice of high-speed driving. The slotted-only rotors are better for heavy-duty applications like trucks and SUVs. Hawk Talon rotor are balanced with precision CNC-milled slots to significantly reduce harmonic resonance issues. Hawk Talon Rotor and Pad Combos are available with several types of pads depending on the application. Performance Ceramic have a friction profile that help your vehicle’s ABS system operate most effectively for better stopping. The pads are Hawk’s quietest, generate very little brake dust, and provide longer rotor life. The LTS (Light Truck and SUV) pads have a ferro-carbon friction compound that provides 20-40 percent more stopping power over stock replacement pads with excellent fade resistance. The pads generate low levels of dust and are ideal for light duty trucks, SUVs, and vans up to one ton. HPS (High Performance Street) pads are Hawk’s claim to fame. The friction compound provides 20-40 percent more stopping power and higher resistance to brake fade than most standard replacement pads. Less fade means you will have better pedal feel and more consistent performance. HPS 5.0 pads provide the greatest stopping power and pedal feel without compromising your vehicle’s ABS system. The ferro-carbon friction compound means shorter stopping distances—especially from high speed—improved performance under heavy braking conditions, and consistent release characteristics for a smooth pedal feel. With over 1,300 applications available, chances are there’s a Hawk Performance Talon Rotor and Pad combo for your late model vehicle.